Click picture to play – opens in new window. A history of the evolution of the guitar in four and a half minutes, from its first appearance in the late 15th century to the present day, featuring guitar music from 1551 to 1970 played by Ian Pittaway, Rolf Lislevand, Robert Trent, Robert Johnson, Lester Junior Barnard, Jimi Hendrix and Martin Carthy. Names of instruments in early music can give rise to much confusion and it pays to be careful. For example, in the 16th century the 4 course renaissance guitar was also known as the gittern in England and France, and so it must not be confused with the unrelated medieval gittern, carved from a solid piece of wood, nor indeed with the baroque gittern, which was a type of very small cittern. Confused? Many reference books, musical dictionaries and websites certainly are, even reputable ones. If, in delineating guitar history, we are to state only what can be asserted with clear evidence, we must start no further back than the renaissance guitar, the first evidence of which (as far as I can find or have seen anyone convincingly present) is 1488 in the Heidelberger Totentanz. This is a German book of 38 prints from woodcuts, author unknown, printed by Heinrich Knoblochtzer. The story in the book and its striking illustrations depict the dance of death, only the second printed book to have done so (the first being published by Parisian printer Guyot Marchant in 1485), in what was becoming a major theme in art. The Heidelberger Totentanz woodcuts mostly feature the figure of death playing or holding musical instruments of the time – lute, bray harp, shawm, tromba marina, bagpipes, psaltery, etc. Two woodcuts depict renaissance guitars. One (below left) has a pegbox we’d associate with the vielle (the medieval fiddle), a flat, round pegbox with the pegheads on top, if we assume that the artist has flattened the pegs so we can see them, so they appear to be protruding from the side. There is no reason in principle why this pegbox was not depicted accurately, with tuning pegs on the side, but if so it would be unique, and surviving instruments with which to cross-reference are absent. The flattening of perspective – assuming these are front pegs flattened to the side – was a typical feature of art until the renaissance, as we see on the other guitar (below right), with the obtuse-angled pegbox likewise flattened sideways so we can see it. This second guitar has a pegbox more commonly associated with the lute, but certainly not unknown on guitars. Two renaissance guitars as represented in the woodcuts of the German Heidelberger Totentanz, 1488. The number of strings and courses on the Heidelberger Totentanz guitars is notable. The guitar on the left above shows 3 strings and 5 pegs, and on the right there are 3 strings and 3 pegs. It is possible to interpret this as a guitar with 3 courses (left), a single top course and 2 doubles, and another 3 course guitar (right) with 3 single strings. This would be in keeping with known practice on other instruments: the gittern, for example, could be strung with single or double courses. If the representations above are accurate and this interpretation is correct, this means the 4 course renaissance guitar we are used to seeing started life as a 3 course instrument. 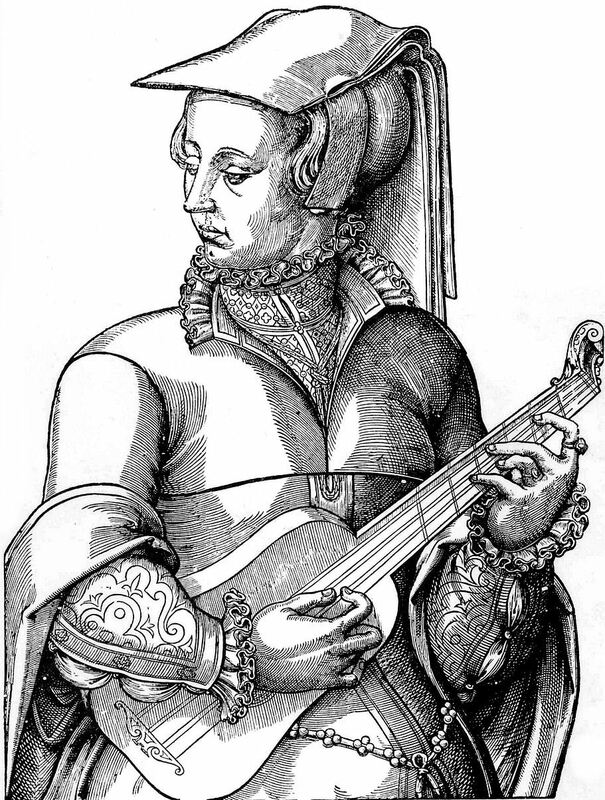 However, illustrations of stringed instruments up to this period sometimes show a disparity between number of strings and tuning pegs, as we see with the Heidelberger Totentanz lutes (below), one drawn with 6 strings and only 5 pegs, the other with 3 strings and no pegs. Without further evidence, and with the complication of clearly inaccurate depictions of other instruments, this matter cannot easily be settled, but this iconography does give us an earliest date for the appearance of the renaissance guitar of 1488. Two renaissance lutes as represented in the woodcuts of the German Heidelberger Totentanz, 1488. The strings of the guitar were made of gut – that’s the small intestines of sheep – as were the frets, which were tied on. The earliest evidence of tuning is 4 courses tuned single a’, double e’, double c, then the fourth course was a split octave with a lower g and an upper g’. In other words, it was tuned in the same way as a modern guitar if you only play the top 4 strings and fret or capo it at the fifth fret, and of course the modern 6 string guitar doesn’t have the upper octave on the fourth course. Or, put another way, it was tuned the same as a modern ukulele, except that the ukulele has all single strings and has only the upper octave of the fourth course. So the 4 course guitar was essentially a smallish treble instrument with a short pitch range and no bass response. The French drawing from 1570 at the top of this article gives an idea of its small size. Most of the surviving music for the renaissance guitar comes from Spain and France, where it therefore seems to have been most popular. There are contemporaneous English references to the instrument, but only a little English guitar music. The first known music for guitar is in the publication Tres Libros de Musica en Cifras para Vihuela (Three books of music in figures – i.e. numbers = tablature – for vihuela) by Alonso Mudarra, 1546. This is a trio of books for the vihuela, a Spanish 6 course instrument shaped like a large guitar (compared to the small 4 course guitar) but tuned identically to the lute in a country where the lute didn’t catch on; and among the vihuela pieces in the first book are a few compositions for 4 course “guitarra”. We have to thank French musician Adrian le Roy for the majority of renaissance guitar music: in 1551-1555 he published nine books of guitar tablature, not all of which have survived. (One of the guitar pieces he published begins the video above.) Another French composer, Guillaume de Morlaye, published three books of guitar compositions in 1552–53 but, like many other guitar publications of the period, only the titles have survived. What we do have is perfectly lovely but, just as Mudarra’s Spanish guitar pieces are stylistically indistinct from vihuela music, French guitar pieces are stylistically indistinct from lute music. It would take the changes present in the 5 course baroque guitar to give the instrument a distinctive voice of its own. A 5 course baroque guitar and player. The painting is attributed to Italian artist Pietro Paolini, 1603–1681. There is evidence for the addition of a fifth course in France, Spain and Portugal in the middle of the 16th century – and, indeed, the earliest surviving guitar is a small 5 course made by Belchior Dias of Lisbon in 1581 – but that fifth course did not begin to gain wide acceptance until the last decade of the 16th century and into the first decade of the 17th century, by now the beginning of the baroque period, when many (but not all) guitars also radically increased in size and therefore lowered its overall pitch. Through the 17th century, a few players still preferred the small 4 course guitar, or a 5 course guitar made in the old, small size; but the new size became the popular choice, and it is this larger-bodied instrument that we now call the baroque guitar for the period roughly 1600-1750. There was a huge variation in shape – thin bodies, wide bodies, tapered bodies, flat backs, fluted backs, bowl backs, various lengths of necks – and some variation in tuning. The first three courses were all tuned in unisons (sometimes with a single first string) – e’ b g. The fourth course was either strung in octaves with the upper octave positioned so it is played first on the downstroke – d d’ – or both strings were an octave above the modern guitar, at the same pitch as the third fret of the second course – d’ d’. Likewise, the fifth course could also be a mix of the two octaves with the upper octave played first on the downstroke – A a – or two strings of the upper octave, playing the same note as the second fret of the third course – a a. These combinations gave the possibility of three different tunings (fourth and fifth course both in octave pairs; fourth and fifth course both at the upper octave; fourth course in an octave pair and fifth course both at the upper octave), according to the preference of the composer or player, so if a guitar player today wants to have a really accurate baroque guitar repertoire, then either three baroque guitars or a lot of restringing is called for. The larger size and the extra course appeared to mark a fundamental shift in the way the guitar was played. A new simplified style of playing was created – the strum or rasgueado – consisting entirely of chords played rhythmically using various combinations of fingers or fingers and thumb. This is the entire idea behind the first tutor for the 5 course instrument, The Five Course Spanish Guitar, by Joan Carles Amat (also spelt Juan Carlos Amat), published in Barcelona in 1596. The author was a pastime musician – he worked as a physician – who created a new shorthand for chords using a series of numbers. He clearly saw the guitar as an instrument that could be easily picked up by anyone, a notion reinforced by the very simple principles in his book. His idea was further developed by Italian singer and composer Girolamo Montesardo’s seminal Nuova inventione d’intavolatura (New invention of tablature) of 1606. For this book, Montesardo created his own shorthand for chords, alfabeto notation, based on Amat’s scheme but using letters instead of numbers, which was to become standard for the new rasgueado repertoire. Part of Folias by Gaspar Sanz, 1675, played on 5 course baroque guitar by Ian Pittaway. Left we see the ‘thumb inside’ technique of the renaissance guitar (and renaissance lute), right is the ‘thumb outside’ technique of the baroque guitar (and baroque lute). (1) Guitarists, in common with lutenists, were now using a ‘thumb outside’ right hand position (assuming a right handed player), much more like the hand position we’d recognise today. No longer was the hand parallel to the strings with the thumb placed inside the hand for a smooth, full sound; now the hand was at an angle to the strings, with the thumb completely outside of the hand, to enable the strumming style and give a sharper, more trebly tone. (2) This is the first evidence of a style we’d most associate today with rhythmic flamenco dance music and song. (3) The rasgueado style was also used regularly to accompany song in a way that was completely different to the renaissance but not too far removed from the strummed guitar-led pop music of the 20th century. (4) The instrument was now more the size of the modern guitar, with nominally the same pitch as today’s guitars. The new style made the guitar popular among dancers in the theatre and the street; and with singers, no doubt because it was now an instrument with a style that could be mastered relatively easily, compared to the lute. For this reason the guitar had a terrible reputation among many lovers of the lute, who thought the guitar crude and easy; and among commentators on religion and morality, who were horrified at the lewd and suggestive dances the guitar was now used to accompany. By 1630 the ‘mixed’ style had developed – battute e pizzicate in Italian – a combination of strummed chords and individually plucked notes, as first shown in Italian composer Giovanni Paolo Foscarini’s Il primo, seco[n]do, e terzo libro della chitarra spagnola (The first, second and third book of the Spanish guitar). It is repertoire in this style that you’ll hear today by players of baroque guitar music, as pure rasgueado strumming is now of limited interest at best to listeners. Childgrove and Nonesuch, both from John Playford’s series of dance manuals, The Dancing Master, published from 1651 to 1728. Both pieces are arranged and played by Ian Pittaway, illustrating the ‘mixed’ style or battute e pizzicate. The new ‘mixed’ style made good use of the stringing on the fourth and fifth courses to create an effect known as campanelas, or little bells. This involves playing consecutive notes on different strings so that the sound of each note continues to ring as the next one starts, like a peel of bells. The baroque guitar’s re-entrant tuning – where strings are out of the usual linear pitch sequence of high to low and so have to re-enter the sequence – makes campanelas much less effort on the left hand and so technically much easier to achieve – as demonstrated here by Stephen Gordon. The first surviving 6 string guitar was built in 1791 by Giovanni Battista Fabricatore in Naples. This is one of Fabricatore’s 6 string guitars from 1795 or 1798. The first-known guitar to have single strings rather than courses was a 5 string guitar built in 1774 by Ferdinando Gagliano in Naples, which had the innovation of brass frets rather than tied gut frets. The first 6 string guitar to have survived was built in 1791 by Giovanni Battista Fabricatore, also in Naples. Guitars with 6 single strings, first made in Italy in the last decade of the 18th century, were copied in Vienna and other European cities in the early 19th century. This was the beginning of the guitar which today we call classical, which now uses synthetic nylon strings instead of gut. The steel strings of the modern folk guitar are a more recent development. 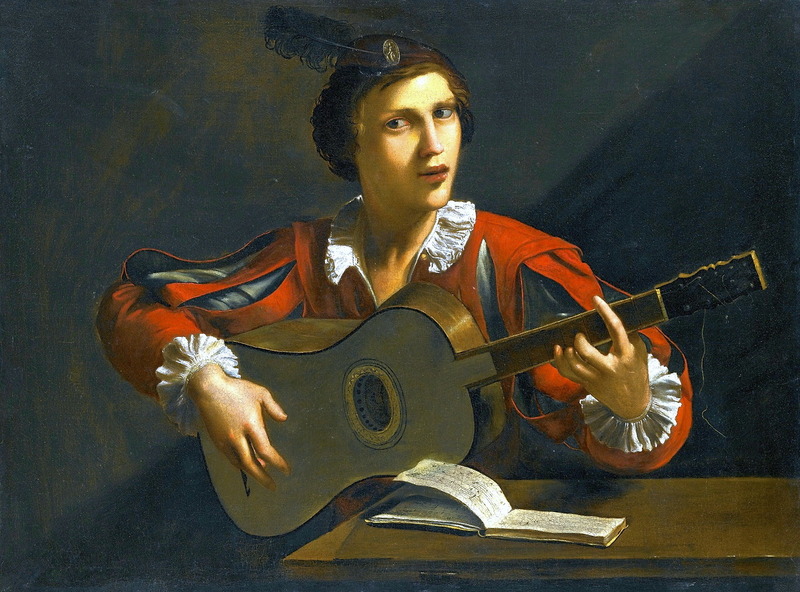 In the renaissance and baroque periods, instruments such as the cittern, bandora and orpharion were strung with wire – that’s iron for the upper pitches and brass for the lower – but guitars were always gut-strung, with the localised exception of the chitarra battente of southern Italy which, in the 15th–17th century, had strings of brass. A small but ground-breaking change in the chemical composition of iron string material enabled the creation of steel strings, developed in the U.S.A. in the 1880s. A new build of guitar was developed for the new strings, to cope with the extra tension on the body created by using steel. 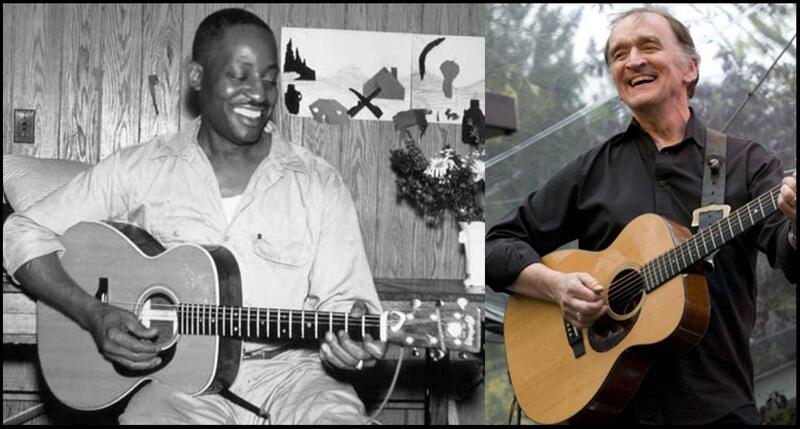 Bill Broonzy and Martin Carthy, two innovators of the steel string guitar. This new guitar grew rapidly in popularity in the United States and throughout Europe during the 20th century, becoming the instrument of choice for a great many performers of blues, jazz and folk music. A convergence of musical styles gave rise to innovations in guitar technique, as blues and jazz influenced folk music. Then the temporary popularity of skiffle, with its simple chordal playing style, made the guitar accessible to almost anyone, rather like the rasgueado style did in the late 16th and into the 17th century. In the 1960s and ’70s, ground-breaking English folk guitarists distilled the influences of blues and jazz on their technique, influenced in particular by the black American blues players who visited England, such as Bill Broonzy. They experimented with non-standard tunings to create, in effect, a different sort of instrument. Foremost in this new folk guitar movement were Martin Carthy, Davey Graham and Nic Jones, whose huge influence is still felt today by steel string guitarists. Steel string guitar in open c tuning playing Fold In Three, composed and played by Ian Pittaway. 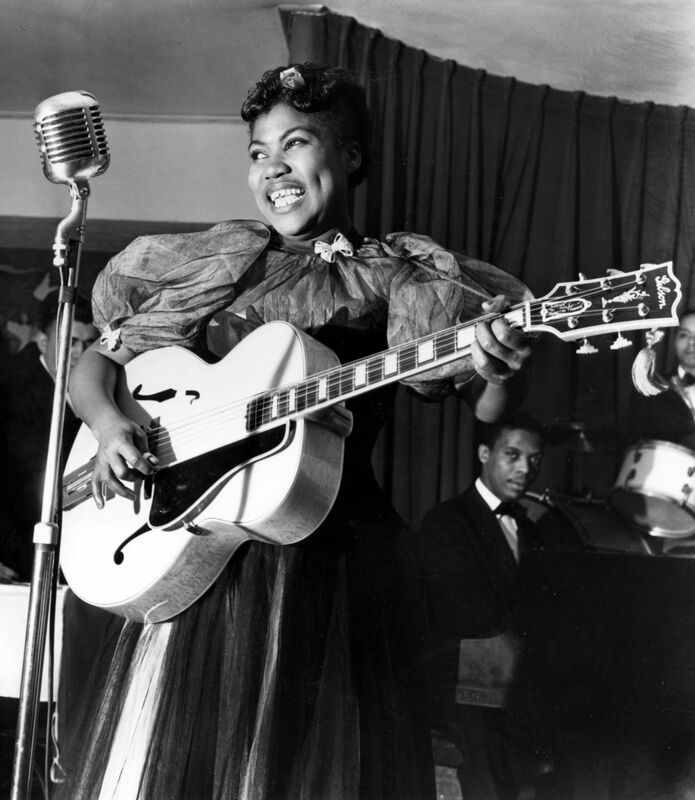 Sister Rosetta Tharpe, extraordinary gospel and blues singer and guitarist, pictured in 1940. Stromberg, however, did not reap the financial benefits of this technological advance, as their products disappeared without trace. Other companies developed pickups and electric guitars in the following months and years, and the advantage of their volume for ensemble playing was immediately recognised by such jazz and blues players as Les Paul, Sister Rosetta Tharpe, T-Bone Walker, and Lonnie Johnson. In the mid 1940s, guitarist Lester “Junior” Barnard discovered that a simple pickup combined with a small amplifier in overdrive gave a distorted sound he liked and utilised, and it was soon emulated by other players of blues, rock and pop music. In the next decade, the electric guitar became the instrument of popular music par excellence, leading to a new designation among rockers: the guitar god, axe man or guitar hero. Though fashions and styles have changed many times since, the steel string acoustic guitar and electric guitar remain integral to popular music and its pre-eminent visual icon. Although I know the lute goes down to medieval times I did not know the guitar went so early! Thank you for a window onto this history. Great article and terrific video.